When you're working on a concrete repair project and time is critical, choose Rapid Set® Cement. 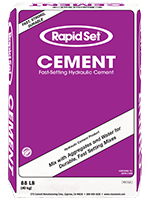 Rapid Set Cement is a fast-setting hydraulic cement for concrete repair, restoration and new construction requiring the highest durability and fastest strength gain. The high-strength, low-shrinkage and superior durability properties of Rapid Set Cement give you exceptional concrete performance on diverse projects including highways, bridges, runways, sidewalks and floors. Mix Rapid Set Cement with a wide variety of aggregates to produce customized 1-hour strength concrete or mortar mixtures. For larger projects, use conventional ready mix or volumetric mixer equipment to batch Rapid Set Cement mixtures.